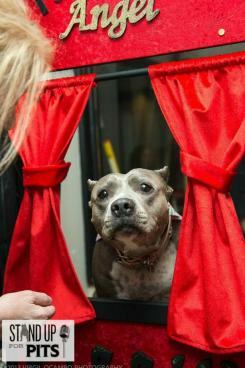 Home » One million pibble march on Washington D.C.
Famed comedian Rebecca Corry knows this all too well. Her rescued pit bull Angel is now a poster girl for pibble awareness. Angel didn’t always live the good life. Angel was found running the streets of Los Angeles severely abused, tortured and subsequently scarred. Her ears had been cut with scissors and she had acid burns on her back. Yet after all the awful things Angel has endured, she knows only how to love. She lives for applause, as she can frequently be found with Corry at any number of her stand-up shows offering kisses for a dollar from her very own kissing booth. You can read more about Angel’s heartwarming story here. “These dogs also flood shelters where they are euthanized at alarming rates. The One Million Pibble March is designed to bring breed awareness to the greater public and to protest against laws that specifically target pit bulls (breed specific legislation, the controversial laws are called)”. Quote from Arin Greenwood of the Huffington Post. There are many things you can do to help! You can donate to the cause directly by clicking here and going to the GoFundMe link on the left-hand side of the page. Or you can purchase a T-Shirt (click here for the T-Shirt) or hoodie (click here for the hoodie). You can also sign the pledge and support us on facebook by spreading the word. You can also make your presence speak volumes without a word and attend the march in May! Tom & Cindy’s very own Sharyn Tomita will be marching and we are so proud to support her. Way to go, Sharyn!